If you have ten or more faculty, a group rate is available. Please email Tammy Peterson at TammyP@lern.org for a group rate. 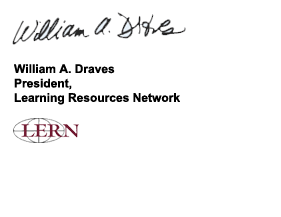 I highly recommend the COI program to everyone interested in online teaching and learning. I give it the maximum five-star rating. 1. 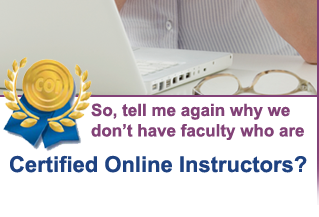 Your instructors are the foremost authorities in online learning. 2. You get your own online course personally critiqued. 3. Your students provide feedback and comments. 4. Take home a framed certificate and a real medal. 5. You earn the right to have the initials COI after your name. Any person who is teaching online should participate. 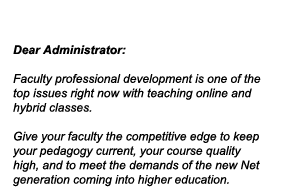 The designation is relevant for faculty teaching totally online, and faculty teaching hybrid or blended courses. 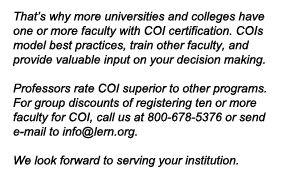 The COI designation was created for faculty in higher education, but other teachers are eligible for the program as well. thinkers and practitioners in the field. having achieved this level of knowledge skills.